Begin by pressing the yellow dot, turn the page and continue following the instructions to embark on a magical journey filled with ever-changing coloured dots and patterns. This engaging book encourages the reader to interact with its pages while watching how the dots respond and change. A simple tap leads to more dots appearing, rub the dots and they turn a different colour, shake the book and the dots scatter! 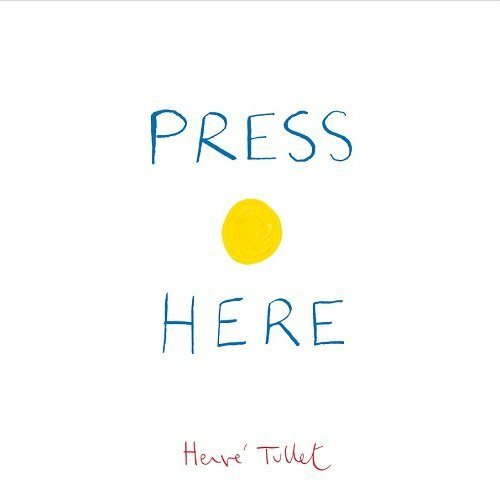 Press Here is a must-have resource for developing children’s language skills as there are so many language skills to be targeted using this book. Children will learn many new action words as they interact with the pages, while simultaneously learning about cause and effect when the dots respond to their actions. This book targets following one-step directions, but instructions can easily be extended beyond the text for children working on following more complex two- or three- step directions (e.g. “press the first red dot and the second yellow dot”). The instructions in Press Here contain many basic concepts, making this a fantastic resource for targeting descriptive concepts (mainly colours and sizes), location concepts (e.g. left, right, middle) and quantity concepts (e.g. all, more, only). For further speech and language goals to target using Press Here by Hervé Tullet, see the list below.